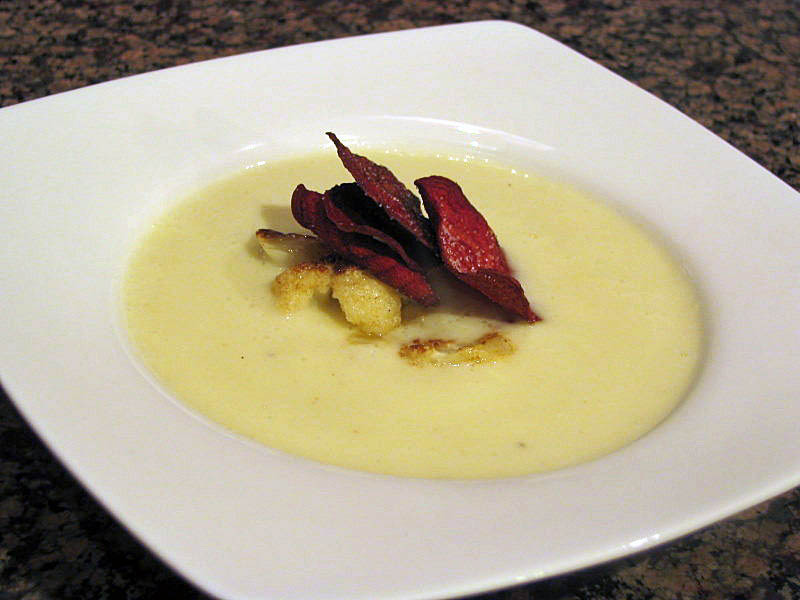 CAULIFLOWER SOUP, All Dressed Up! I’ve made many types of cauliflower soup, from simple versions (cauliflower, onions and water) to involved interpretations in which the cauliflower is first roasted, then paired with different spices, truffle oil, etc…. you get the picture. Thomas Keller’s recipe takes the soup to a new level. Not only because the red chips refine its look, but because it also tastes refined. You’ll swoon over the first spoonful, and then wonder if any other mix of flavors could work so well together. Remove the leaves and core of the cauliflower, separate about 1 cup of good-looking florets, not larger than a quarter, and reserve them. Chop the rest of the cauliflower in chunks of similar size. Melt 1.5 T of butter in a large saucepan, add the chopped onions, curry powder, and cauliflower, sprinkle 1 tsp salt, and cover the whole mixture with parchment paper, making a “false lid” right on top of the cauliflower. Cover the saucepan with its regular lid, cook for 20 minutes, stirring occasionally, until the cauliflower starts to get tender. Remove the parchment paper, add milk, cream, and water to the pan, and simmer, skimming the foam every now and then, for 30 minutes. Carefully transfer the mixture to a blender (I did it in three batches), and blend until fully smooth. Adjust the seasoning. Make the red beet chips…. Peel the beet (wear gloves) and make paper-thin slices using a mandoline. Ideally, you want to use only nice, full circles (good luck!). Heat the peanut oil (about 1 inch of oil in a deep pan), and once it is hot but not smoking, add a few beet rounds. Fry them until they stop bubbling hard, it should take a little over 1 minute. Place them on a baking sheet over paper towels, seasoning with a little salt right after frying. If needed, keep them warm in a 200F oven. Bring some salted water to a boil, add the teaspoon of vinegar, and cook the reserved florets until tender, about 5 minutes. Drain them. Right before serving, melt the remaining 1/2 T butter in a small pan and allow it to get dark golden. Watch it carefully, because burned butter is nasty, and tastes bitter. Once the butter is turning a nice golden brown, add the florets and saute them until golden too. If the soup is too thick, thin it with a little water. Ladle it into a bowl, add some cauliflower florets in the center, and a few beet chips on top. Serve more florets and chips alongside. to print the recipe, click here. Comments: My only modifications were to slightly reduce the amount of heavy cream, and omit the croutons called for in the original recipe. 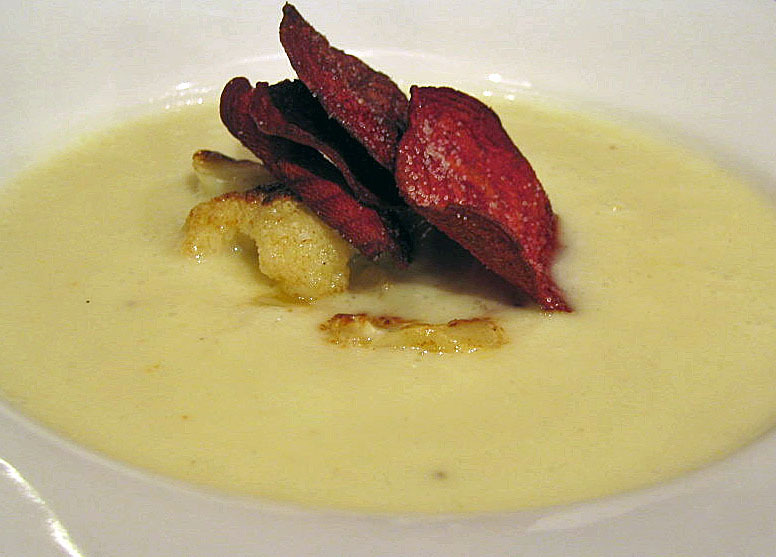 Keller recommends serving a few chips on the soup itself, and the rest on a separate plate, because they may get soggy. I actually didn’t find that a problem: they released a bit of red juice into the velvety soup, creating a nice visual appeal, and they weren’t soggy to the point of losing their texture. You’ll notice that he uses a false parchment lid over the veggies, an important step. The dish has little liquid at that point, basically only some moisture released by the onions – by using the parchment “lid”, you lock the moisture in, and at the same time the curry becomes nicely toasted and permeates the cauliflower more efficiently. Making the beet chips was an adventure… The book shows a photo of Thomas Keller in a pristine looking kitchen, with perfect rounds of chips resting on a baking sheet, well organized in perfect rows. It made me feel… let’s say…. a little inadequate… My kitchen looked like the set of a horror movie, red beet juice everywhere, and carbonized chips begging for the trash can to end their misery. Oh, well – at least I managed to get enough chips to serve to the two of us. This is a classy soup, so if you are into soup shots to open a dinner party, it could be a fine option. Retire as folhas e o centro da couve-flor, separe cerca de 1 xícara de florzinhas inteiras com no maximo 2 cm de tamanho, e reserve. Pique o restante da couve-flor em pedaços, incluindo os talos. Derreta 1,5 colher de sopa de manteiga em uma panela grande, adicione a cebola picada, o caril e a couve-flor picada, polvilhe com sal, e cubra toda a mistura com papel manteiga, fazendo uma tampa falsa direitamente em cima da couve-flor. Feche a panela com a tampa normal, cozinhe por 20 minutos, mexendo ocasionalmente, até que a couve-flor comece a amolecer. Retire o papel manteiga, adicione o leite, o creme de leite e água e cozinhe por cerca de 30 minutos. Transfira a mistura para um liquidificador e processe ate’ que fique bem homogenea (faca em diversas vezes, se preciso). Faça os chips de beterraba …. Descasque a beterraba (com luvas) e corte em fatias finissimas. O ideal e’ obter fatias completas, circulares. Aqueça o óleo de amendoim (cerca de 2 cm de óleo em uma panela funda), e frite algumas fatias de beterraba de cada vez. Frite até que parem de borbulhar, um pouco mais de um minuto ao todo. Va’ colocando as fatias sobre uma assadeira forrada com papel absorvente, temperando com sal assim que sairem da panela. Se preciso, mantenha as fatias aquecidas em um forno baixo. Cozinhe as florzinhas de couve-flor reservadas …. Coloque um pouco de água salgada para ferver, adicione a colher de chá de vinagre e cozinhe as florzinhas por cerca de 5 minutos. Escorra. Pouco antes de servir, derreta a manteiga restante (1/2 colher de sopa) em uma panela pequena ate’ que fique dourada, sem deixar que queime. Acrescente a couve-flor e refogue ate’ que fiquem bem douradas. Se a sopa estiver muito grossa, adicione um pouco de água. Sirva a sopa, acrescentando algumas florzinhas de couve-flor no centro, e chips de beterraba por cima, como mostra a foto. Ha! I found the beet chips, they sound great! Thanks for the tip!